The motivation for change, however, is far too often a costly disaster, often with substantial losses in lives and livelihoods. The future can be different. A commitment to building resilience, paired with accurate and actionable risk information, can help bring about a safer world before these events impact our most vulnerable communities. 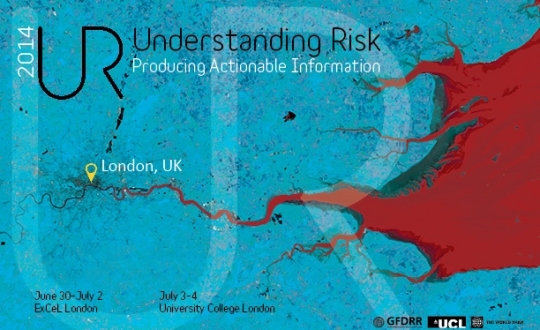 To inspire global action, the World Bank-managed Global Facility for Disaster Reduction and Recovery (GFDRR) will host – in partnership with the University College of London and the Willis Group – the third biennial Understanding Risk Forum in London, UK, on June 30-July 4, 2014. The Understanding Risk Forum is the premier global conference on disaster risk assessment, aimed at bringing together diverse communities – including policymakers, academic researchers and the private sector – engaged in building resilience against hazards that threaten the world’s most vulnerable communities. This year’s forum, which is expected to draw nearly 900 participants from around the world, focuses on “producing actionable information,” and will showcase innovative technology and risk assessment tools that can be scaled globally. With estimated damages exceeding 2 billion euros, the recent historic floods in Bosnia may send the country headlong into a recession. Financial protection is critical for economic resilience; yet insurance pricing often does not accurately reflect risk levels. To address this challenge, risk financing will be a special theme in this year’s forum, which will convene global insurance leaders, encouraging dialogue and collaboration between these industry experts and the range of other actors working to mainstream disaster risk management in development efforts. Events and sessions will feature risk modeling approaches, pioneering financial protection mechanisms, and lessons on risk financing from around the world. Technological innovation has also transformed our ability to identify disaster risk, offering unprecedented opportunity for collaboration with nontraditional partners. In 2011, the World Bank launched the Open Data for Resilience Initiative (OpenDRI) to apply the philosophy of the open data movement to the challenge of building disaster resilience. OpenDRI has enabled 40 million people in 24 countries to access risk data through data sharing platforms, opening more than 1,300 natural risk hazard datasets to the public. To promote the opening of risk data and the development of open source tools, the Understanding Risk Forum will feature an award ceremony for the winners of Code for Resilience, an initiative that paired natural hazard experts with local technologists to find inventive approaches for improving disaster resilience. The winning apps – developed by design, architecture and computer science students and young professionals in Indonesia and Japan – share early disaster warnings and information related to flood risk and escape routes. Since the first Understanding Risk Forum held in 2010 in Washington, D.C., there has been momentous growth within the global disaster risk management community. “Understanding Risk: The Evolution of Disaster Risk Assessment,” a publication to be launched later this week at the forum, highlights emerging best practices from technical specialists, institutions and governments in more than 40 countries, each embodying the kind of actionable risk information this year’s Forum seeks to catalyze. GFDRR and the World Bank disaster risk management team look forward to working with participants this week to find a more effective path toward resilient development.